Location: Vissec, in the Gard departement of France (Languedoc-Roussillon Region). Notes: Château de Vissec is a medieval castle in the eponymous town in the Gard department. First mentioned in 1084. Located perhaps on the site of the Merovingian bishopric disappeared Arisitum or Arisdium (can do: Barren and we are Vissec). This is quoted in the History of the Franks Gregory of Tours. A Latin text presents him as "the spirit of a source." This description glue ground: Vis goes above the village, only to reappear downstream Foux! This castle is the subject of a registration as a historic monument since February 2, 2009. Castle and Castellas are independent. But the castle which took over the castellas ruined twice in the seventeenth century, is built on a part of it.The Vissec Latude family is a noble family whose extraction proven filiation goes back to the fifteenth century. But we find a Gerard Daudé Vissec in late eleventh century in the cartulary of the Abbey of Gellone.April 27, 1497, Jean de Montfaucon, Lord of Vissec since her marriage to Antoinette Millasse (Meillasse, Milhasse) Lady Vissec, August 3, 1458, appeared before noble and powerful Jean Pierre, Lord of Pierrefort (Peyrefort) Ganges and Hierle and promises to force to him as did his predecessors to the lords of Hierle.In 1541, Francoise Pierre, Baroness Pierrefort and Hierle, wife of Jean Boyer, Lord of Vénéjan, sold the barony of Hierle to Fulcrand Montfaucon, Lord of Vissec.November 2, 1570, Jacques de Montfaucon, Lord of Vissec degree in Law, first consul of Montpellier, President, Court of Aids of this city, attends the States General of the province in Beaucaire. Vissec depends on the barony of Hierle.Fulcrand Montfaucon, son of Jacques married in 1578 Anne of Brancas, daughter of André Baptiste de Brancas, lord of Villars, Admiral of France.On 27 August 1628, as part of the war between Protestants and Catholics, the Duke of Rohan instructs Fulcran II Assas to shave completely the castle, the village houses and the mill Vissec of Foux. In September, hearing that the auctioning of razing did not work, he orders the viguerie Vigan to send a called career with 60 120 soldiers and pioneers and masons. December 22, 1628, Career demand payment of all expenses of his troop which remained until Vissec entire demolition. 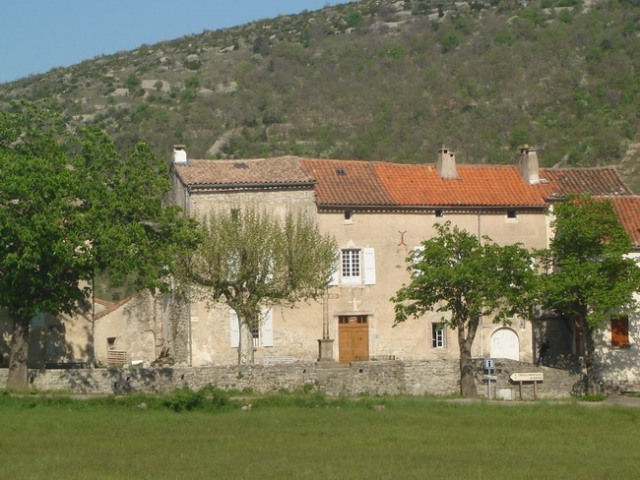 If the walls and defensive points were laid low, Christophe de Montfaucon, baron Vissec, Baron Hierle (Hyerle, Yrle or Yerle) can still live in what remains of the buildings. Le site officiel, au cœur de l'histoire !